1997 Space Ghost Coast to Coast Leonard "the Gray Ghost" Ghostal (voice) A former professional wrestler (and Space Ghost's grandfather), in episode "Piledriver"
1999 Walker, Texas Ranger Whitelaw Lundren Episode "Fight or Die"
1999 Mad About You himself Episode "Separated Beds"
2001 Nikki James "Pretty Boy" Carter Pro-wrestler, in episode "Fallback"
↑ 1.0 1.1 1.2 1.3 1.4 1.5 1.6 "Randy Savage's Profile". Online World of Wrestling. สืบค้นเมื่อ May 1, 2008. 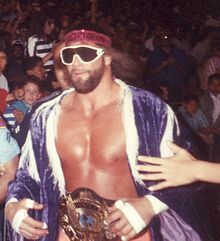 ↑ 2.0 2.1 2.2 2.3 2.4 2.5 2.6 "Randy Savage's alumni profile". WWE. สืบค้นเมื่อ May 20, 2013. ↑ 3.0 3.1 3.2 ""Macho Man" Randy Savage's Professional Wrestling Hall of Fame bio". Professional Wrestling Hall of Fame and Museum. Archived from the original on June 5, 2011. สืบค้นเมื่อ May 21, 2011. ↑ "Randy Savage's Wrestle Data". Wrestling Data Net. สืบค้นเมื่อ May 1, 2008. ↑ 5.0 5.1 "Randy Savage's Bio". Accelerator's Wrestling Rollercoaster. สืบค้นเมื่อ May 1, 2008. ↑ 6.0 6.1 "Randy Savage's Profile". Gerweck.net. Archived from the original on April 15, 2008. สืบค้นเมื่อ May 1, 2008. ↑ "The Top 25 Intercontinental Champions". World Wrestling Entertainment. Retrieved June 24, 2010. ↑ 9.0 9.1 "WWE King of the Ring Winners". WrestleView. สืบค้นเมื่อ May 4, 2008. ↑ "Hulk Hogan Discusses Which Wrestler He Wants To Induct Into The WWE Hall Of Fame". Wrestling Inc. สืบค้นเมื่อ March 23, 2013. ↑ Meacham, Andrew; Pittman, Craig (May 20, 2011). "Former wrestler Randy 'Macho Man' Savage killed in Seminole car wreck". St. Petersburg Times. สืบค้นเมื่อ May 23, 2011. ↑ "Former wrestler 'Macho Man' Randy Savage dead after heart attack, car crash". Bay News 9. May 20, 2011. Archived from the original on May 23, 2011. สืบค้นเมื่อ May 20, 2011. ↑ Medical Examiner: Randy "Macho Man" Savage died of heart disease – St. Petersburg Times Archived 2011-07-03 at the Wayback Machine. 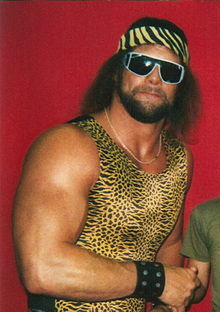 ↑ "Report: Macho Man autopsy unveiled". Fox Sports. May 23, 2011. สืบค้นเมื่อ May 27, 2011. ↑ 23.0 23.1 23.2 23.3 23.4 23.5 23.6 "PWI Awards". Pro Wrestling Illustrated. Kappa Publishing Group. สืบค้นเมื่อ December 17, 2016. ↑ "Pro Wrestling Illustrated (PWI) 500 for 1992". The Internet Wrestling Database. สืบค้นเมื่อ January 13, 2015. ↑ "Pro Wrestling Illustrated's Top 500 Wrestlers of the PWI Years". Wrestling Information Archive. Archived from the original on February 27, 2009. สืบค้นเมื่อ March 26, 2009. ↑ "Pro Wrestling Illustrated's Top 100 Tag Teams of the PWI Years". Wrestling Information Archive. Archived from the original on March 25, 2009. สืบค้นเมื่อ March 26, 2009. ↑ "Randy Savage's first WCW World Heavyweight Championship reign". WWE. ↑ "Randy Savage's second WCW World Heavyweight Championship reign". ↑ "Randy Savage's third WCW World Heavyweight Championship reign". ↑ "Randy Savage's fourth WCW World Heavyweight Championship reign". Archived from the original on 2012-03-24. ↑ "Randy Savage's first WWF Championship reign". WWE. ↑ "Randy Savage's second WWF Championship reign". ↑ "Randy Savage's first Intercontinental Championship reign". WWE. ↑ Meltzer, Dave (January 22, 1996). "Jan. 22, 1996 Wrestling Observer Newsletter: Results of the 1995 Observer Newsletter Awards, 1995 Record Book, tons more". Wrestling Observer Newsletter. หน้านี้แก้ไขล่าสุดเมื่อวันที่ 20 กรกฎาคม 2561 เวลา 20:54 น.